Murray State’s Board of Regents has endorsed the university’s strategic plan with some commentary regarding university marketing and branding. The development process of the seven-year plan has been ongoing since the fall of 2014. Comments from regents Susan Guess and Dr. Constantine Curris suggested the plan needed a bold approach to developing a Murray State brand. 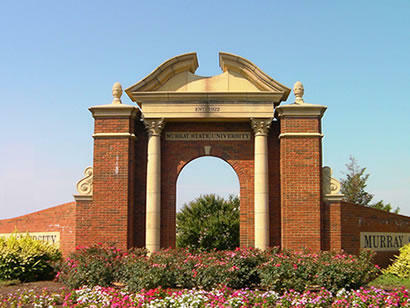 The plan has four broad objectives: Advancing a Culture of Academic Excellence, Promoting a Dynamic and Diverse University Community Committed to Student Success, Advancing Knowledge to Benefit Society by Fostering Research, Scholarship, and Creative Activities Improving the Quality of Life for our Communities through Engagement. The marketing and branding efforts will largely be the responsibility of a soon to be hired Vice President for Marketing and Outreach. The Board of Regents approved new admission standards. The decision comes after President Bob Davies implied during the board's summer retreat that MSU doesn’t serve a portion of students well. Davies said some students accepted to MSU who aren’t necessarily college ready or whose likelihood of success is very small tend to accumulate debt and rarely graduate. He anticipates the newly adopted standards will limit those scenarios. Tier 1: priority admit, 23 ACT score or higher and meets all other admission requirements, Tier 2: regular admit, 18-23 ACT and meets all other admission requirements, Tier 3: conditional admit, 18 ACT score requires one developmental course and meets all other admission guidelines. Tier 4: conditional admit B (Pathways to Success), 18 ACT and requires up to three developmental courses. Previously students with ACT scores less than an 18 had been admitted with restrictions those students will no longer be admitted. Those students will be referred to a regional community and technical college to receive remedial courses to help ensure success at a four-year institution. The board also approved the university’s $169.2m budget that included a three percent tuition increase coupled with a five percent increase for housing rates excluding college courts. The budget is $6m higher than the previous year. The board also approved a complex system for raises for faculty and staff. Effectively staff making $25,000 or less received a 1.5% raise. All staff who make $25,000 or above received a 1.5% raise for their first $25,000 of income and a 1% raise for any income above $25,000. The board was briefed on plans to modify pricing and scholarship models. According to Fred Dietz, Associate Vice President for Enrollment Management, Murray State has one of the most complicated pricing models in Kentucky. Dietz’s presentation included simplifying the pricing models by offering four specific rates they include a rate for students in the 18-county service region, a rate for Kentucky residents, a rate for students from certain regional states, and a single rate for out of state and international students. Dietz also discussed changing merit scholarships awards to a percentage of tuition based on a student’s GPA and ACT score rather than a flat dollar amount. This information wasn’t presented for board action. The board approved a one-year contract for interim provost Tim Todd. The board also received information regarding the contract for men's basketball coach Steve Prohm. According to media reports Prohm may be recruited for another coaching position. Prohm's buyout rate for the next three years is $490,000. Murray State University's Board of Regents approved a tuition increase and the establishing of an Honors College during its quarterly meeting today.